But relative to the 2007-2009 recession, the current capex-poor downturn is puny, a cash-flow review shows. The standard criteria used to gauge the length of recessions, the ones used by the National Bureau of Economic Research, include GDP, employment and income. 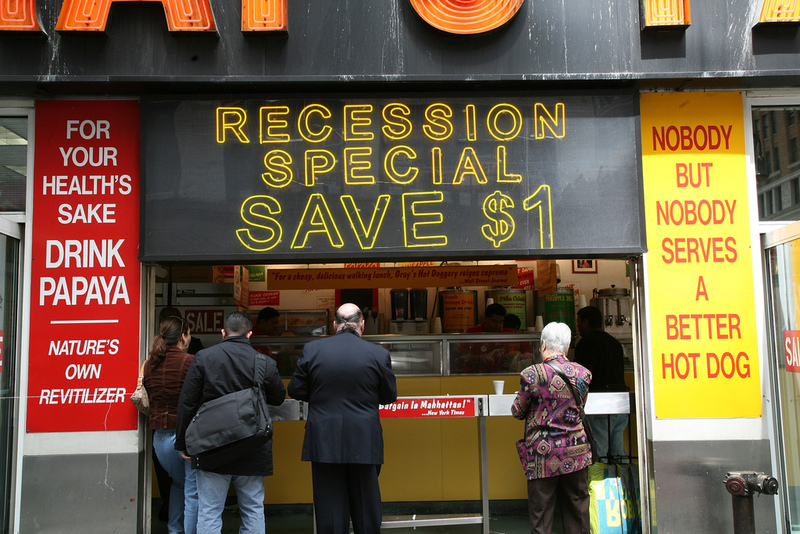 Viewed according to the NBER’s measurements, our most recent recession — at 18 months, the longest in post-World War II history — ended in June 2009. Yet if you look at the economy through the lens of the cash flow of corporate America, we’re still stuck in a recession. There won’t be any improvement in the U.S. economy — especially not increases in hiring — “until we start seeing improving revenue growth, which just isn’t there,” says Charles Mulford, the lab’s director and a Georgia Tech accounting professor. That hesitation is revealed in the actions companies have taken to generate free cash flow and return it to shareholders in the form of dividends and buybacks, according to the professor. Despite decreasing sales, companies have been able to keep their free-cash margins (free cash flow divided by revenue) basically flat at nearly 5 percent over the last year, the lab reported. How were they able to keep the same amount of money available to shareholders? Mostly by cutting back on capital expenditures. Median capex fell to 3.5 percent of revenue during the year ended September 2013 from 3.6 percent in June 2013, “the third straight quarter of decline following the post-recession ascent,” according to the report. “Although not a large decline, the continuing decline suggests that companies are becoming more cautious as median revenues decline,” the Georgia Tech authors wrote. Nevertheless, the caution is nowhere near the levels of fear that prevailed in the wake of the 2007-2009 recession, when companies boosted their median free-cash margin above 7 percent for the 12 months ending March 2010. During that time, companies “got very tight with spending, cut inventory to the bone, cut capital spending to subsistence levels,” Mulford said. We’ll know we’re out of the recession when we see sustained revenue growth, increased capital spending and improved gross margins, he adds. Good article, but I suspect that when the same measurements are taken one and two quarters on that a very different picture might emerge. Anecdotal evidence would suggest that the general business mood has lifted in the last 3 months (to January 2014) and that more companies are considering spending that cash. But companies have also learned to be cautious in how they are spending that cash which will be good news for those selling fixed asset investments and bad news for those with overpriced services. Without a significant rebound in employment the funds to spend that are needed to drive business just aren’t there. Labor participate is at an all time low. U6 unemployment is a disaster. GDP numbers are fluffed compared to prior calculations using a different algorithm. Housing starts are up but mortgage apps are way down. Earnings are tapering with no realistic means of sustaining them at prior levels. Velocity of money is down. Europe, our largest buyer of our exports, at or near recession with France and Italy having their own debt crises yet to come to a head. So many indicators are negative with the potential downsides that could easily tip our economy downward. 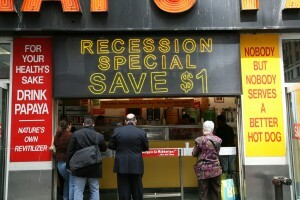 Amidst all this, we get economists and media blowing smoke about an economic rebound. I agree with the above comment that the circle cannot be broken because revenue demand is not there. People and business do not want to spend , credit is tight by banks and very few companies relatively speaking want or need more financing unless it is for acquiring a synergistic business. The problem is excessive supply capacity from low cost areas (globalization) with constrained demand (stagnant disposable income) is causing the economy to lack confidence in building new capacity (investment). The stagnant disposable income comes from a shift to more unstable income (part time work and resulting declining wage levels) and lower participation rates. While the actions of the Fed have been to cause the dollar to fall to reduce excessive low cost supply, this has been met with counter measures. New products and innovation will not solve the problem because of the rate that globalization takes away the advantage. Fortune 500 ship new technology to China, India, and Mexico on a routine basis, taking away any advantage. Part of their routine is to “invent in America”, then manufacture in 3rd world. The solution is political, because politics got America into its current situation. That won’t be done until the political fundraising rules in Washington are changed to eliminate the Fortune 500 and New York banker bias. America is in a state of decline, and because of the open ended excess supply capacity, combined with too much debt, will continue to decline. Welcome to Japan 2. Jim, I am in agreement with your comments relative to the current mess. Looking back through-out the past year, CFO articles have continually pointed to the excess cash build up in companies (in general). When we, as a nation, can purchase goods and services at a lower landed cost than we can create within our own Country we most certainly have a problem. differ on the conclusion … the solution IS political, but nothing to do with political fundraising (with the exception that ONE party is hand-n-hand with the regulatory state … turning the government into a money laundering system). Its not only too expensive to manufacture in America, it is IMPOSSIBLE to manufacture in America. Under the current regime, regulatory costs have skyrocketed, and in many cases they just plain shut down entire sectors. This was BY DESIGN : obviously everybody has seen the video of The Pen-n-phone Dictator declaring he would drive industries out of business. In the UK we are expected to believe, according to Government statistics, and the IMF that we rae coming out, or even out of recession. However as the Bank of England and others who know the virtuous circle that is cash flow still point to the fact that QE and therefore inflation will now cause larger cash flow issues. As corporates now spend heavily on CAPEX and property prices rise it leads to cash being spent in large amounts but not on products or services but on one off (say 5 year duration) projects that leaves little cash flow in the economy.